It's Hyakunin Issho time again - and here's the first issue of the final year of the long project. As usual for the Spring issue, there's a short report on the January exhibition, along with another in the ongoing series of 'Visits to a Craftsman'. There's a bit of a different twist in that story, but you'll find out about that when you get inside. I hope you find something of interest in this issue. During those years of intensive focus on flute playing, I had always completely ignored any kind of influence from my father, as I pretty much looked 'down' on his kind of music. But exposure to a lot of popular music came with the job at the music store, and I gradually became both less ignorant and less prejudiced about it. With my orchestral 'career' going nowhere, I guess I was more open to other ideas, and when a friend called one day to tell me that there was a musical job available in a downtown hotel, I was ready to listen. The music in the very posh restaurant of the town's most exclusive hotel was supplied by a group of seven musicians. A group of three (including flute) came out first to play light dinner music; some time later they were joined by four more to make up a small orchestra to play a set of dance music. It was a very interesting job, but there was one large catch - the flute player in the trio had to switch to saxophone for the dance set. When I called the man who was doing the hiring, he asked me to come on over to his house with my instruments and play for him as a tryout. I started to mention the saxophone, or my lack of one, but he cut me off, "Bring that with you too, and let's play some tunes together!" We set a time for the next day ... And then of course, I certainly started to regret all those years of living together with a professional saxophone player and never showing any interest ... But it didn't bother me too much; in my mind I was still convinced of the superiority of classical musicians. I bought a saxophone from Bill, took it home and tried to figure out how to make it work. So there I was a few days later, in the musicians' room of the hotel in a brand new black suit, getting introduced to the other players. Three of us then went out to start the first set, and my 'professional' career began in earnest. I certainly didn't know all the songs we had to play, but the leader of the trio started each one, and I then picked it up as we went along. It was great fun, but about an hour or so later I saw the other musicians coming out onto the bandstand and knew that the next part wasn't going to be quite so easy. We all took our places and I picked up the saxophone and put the strap over my neck - it was so heavy compared to the flute! The leader called out the first tune. It was a big pop hit, and as we started I noticed half-way down the page a big empty section where nothing was written but a string of chord symbols - a long ad lib solo for the tenor sax! As we approached the solo section the leader waved with his arm for me to stand up, and I launched into my first ever improvised solo. Even now when I think about this I want to squeeze my eyes shut in fear, but I guess I must have kept them open. I know so because I will never ... never ... be able to forget the look on the orchestra leader's face when my incredible noise blurted out through the microphone over the whole room. It must have sounded like a flock of dying geese ... But it was actually mercifully quick - he made a frantic slashing motion to cut me off, and pointed to the guitar player, who quickly jumped up and poured out a great solo to fill the empty space. So began one of the best experiences I have ever had. I was still extremely busy with the day job, but when that was done each day, I drove over to the hotel in time for four hours of music making. My musical skills improved day by day, and I of course soon forgot all about my disaster on opening night; here I was ... a 'real' musician at last! 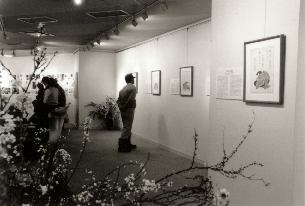 The exhibition this year was - unexpectedly - a wonderful success. I say 'unexpectedly' because I had really thought that this would be a very 'quiet' year. It's not that I was pessimistic about my own work, but just that I didn't anticipate a lot of media attention. Although I sent out the usual large number of announcements to various media outlets, I assumed that the editors in those various magazine and newspaper offices would think, 'We'll do a story on this guy next year when he's finished ... not this year.' As it turned out, most of them seem to have indeed thought that way, and I anticipated a moderate attendance. 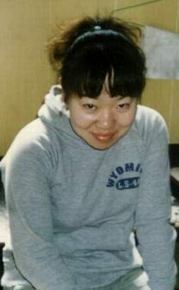 But although the overall media attention was moderate, I learned that it is not quantity that is important, but quality! I got a phone call one day inviting me to do a half-hour interview on NHK national radio early morning on the Saturday during the show, and of course accepted gratefully. I had a good time chatting with the program host about this and that, and didn't really expect too much to come of it, but as it turned out, hundreds of people each day came by after listening to the program - all curious to see what the prints looked like. It seems that radio is sometimes better than TV for this sort of thing; on TV people can see the prints, and they don't need to get out of their armchairs; but on radio they can see nothing, and curiosity is aroused. Mainly as a consequence of that short interview, this year's show was one of the busiest exhibitions I've ever had. 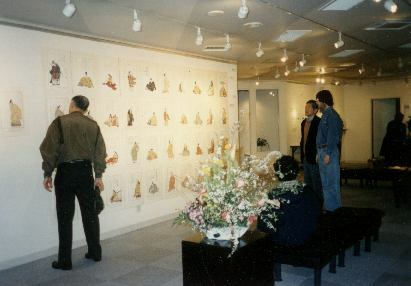 And both for just showing the prints and talking to people, and for the 'business' end of things, it was an excellent show. And by the time you read this, I'll be well on my way 'down the home stretch' - the last ten prints! This story is long overdue. Up until now, because I've concentrated almost exclusively on introducing you to older more experienced workers, you have probably picked up the impression that in a few more years when all those 'old guys' have passed away, traditional woodblock printmaking will be finished. I too have been guilty of thinking that way, and it's time to redress the balance - so meet printer Hiroshige Matsuzaki and carver Kayoko Koike. 'Old guys'? No way - even if you add their ages together, they still only have four more years than me - and I'm just 46! 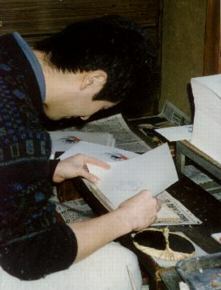 Those of you who have been reading these newsletters from the beginning will perhaps remember Hiroshige; he appeared for a moment in the story that I wrote about his father back in issue #4, although I wasn't so polite to him then - I showed only the back of his head in the photographs! At that time he was just getting started in this field, but he has now built up about ten years of experience as a printer, and as I talk to him I can sense that he feels much more confident about both his skills and his position as a member of this group of craftsmen. 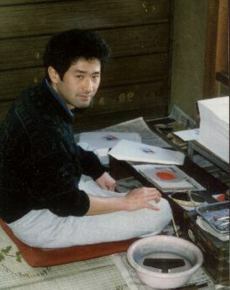 During these years of working together with his father he has made an awful lot of prints, of many different types, and has learned many techniques about which I still know nothing. But even after ten years of training it seems that he still considers himself to be an apprentice, and tells me that it will probably be another five years or so before he becomes ichi nin mae, a craftsman in his own right. Kayoko san has not been carving that long; she joined this trade after graduating from high school three years ago. She told me that the first carving jobs she was given were woodblocks filled with texts from nagauta, a very old type of traditional singing, and I was a bit surprised to hear this, because I have read that this is exactly how a carver's apprentice was started off hundreds of years ago. But she said that carving these bold cursive characters is a very good way to develop one's skills at working the knife around curves in every direction, without moving the block. This is exactly the kind of disciplined training that I have not had, and I envy her the firm foundation she is developing. This made me wonder if her oyakatta, the man from whom she is learning, is an old-fashioned strict teacher, but it seems that he is approachable; she is not being left to figure things out for herself, and her working environment is open and congenial. Kayoko san and I have one thing in common, the fact that people use the word mezurashii (unusual) to describe our situation. But just as I would rather be judged on the quality of my work rather than on the colour of my hair and eyes, she doesn't feel that her gender makes any difference at all; she is a carver - a shokunin. 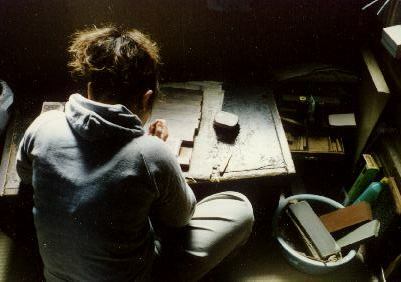 As the three of us sat chatting in a restaurant the other day, it became apparent to me that she is perhaps the one who is the most authentic shokunin; when I asked whether or not she felt that her name should appear on the finished prints, she felt that it wasn't important, it was just her job to carve the blocks. For me of course, it is essential to have my name there, and Hiroshige too felt that he doesn't mind his name being attached to work of which he is proud. I think this is perhaps more common these days, after all, so few people are left who can do this job, isn't it right to feel some pride at being one of them? Hiroshige-san, Kayoko-san, I wish you every success in your future work, and hope that woodblock printmaking brings as much happiness and satisfaction as to each of you, as it has to me. Some two years ago I wrote a story in this newsletter that introduced you to the Toyo Bunko, and to Mr. Isao Koyama, the librarian there who had allowed me to study the original Shunsho book that I am reproducing. As I have here in my workshop a complete set of slides of that original book, and also now own a copy of the volume, it has not been necessary for me to visit the Toyo Bunko very often in recent years, but it will soon be necessary for me to start planning for my next project, so I went down there recently intending to discuss with Koyama-san some possibilities for such future work. I was not able to have such a discussion. 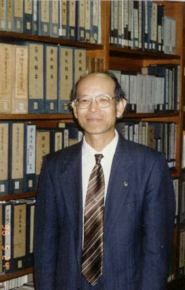 When I approached the counter in the reading room, and talked with the young man there, I was given the news that Koyama-san had become very ill last summer, and after a short hospitalization, had succumbed to a terminal cancer. On the Tokyo streets just outside the tall dusty windows, the scene changes every time I come by; old buildings are gone and new ones have risen in their place. This place though, is protected from all that. There are very few things in our lives that are permanent and without change, and I guess over the years I had come to think of this room as one of them. But I was rudely reminded that this was not true, and that nothing can be 'permanent', when that young man so casually remarked 'Oh, Koyama-san is dead'. Now I don't know much about psychology, but one doesn't need to be much of a psychologist to understand the real reason underlying my disturbance about hearing this news. Today Koyama-san ... tomorrow it will be my turn. Of course I don't mean 'tomorrow' literally; I feel very active and healthy, but I am sure that Koyama-san felt that way too. He was wrapped up in his own researches into Eastern architecture, and I imagine that when he became ill he must have felt extremely frustrated at being unable to continue his work. If I were to receive such a diagnosis I know that I would want to scream "No, no, not now! I'm busy! I want to make more prints ..."
Perhaps one day it will happen that I will become 'tired'. I will be ready to lay down my tools, to put away my books, to stop asking so many questions ... I suppose this will be inevitable; I too will have to accept that although life for other people will go on, mine will have to come to an end. But Oh, I hope that time is still a long long long way away ... There are so many beautiful prints waiting to be made!